Has anyone seen the new replica blaster that has been released by Lucas. It is exact size and color, comes in a museum quality casing and is signed by Mr. Bulloch himself. This is the ultimate collectors peice and I would give my right eye (as wayne would say) for this cooler then cool item. So if any one wants to buy me one I would owe you a life debt ala chewbacca! heheheheh........................no seriosly! Master Replicas actually had one on dsiplay at the San Diego Comic Con last week. It's a lot bigger than I thought it'd be, and looks really sharp. We're going to be mentioning it in the next news article about the Comic Con, but here's a pic for you in the meantime. Enjoy. I've got my Signature Edition on pre-order, and I can't wait. My E-tailer suggests that it is shipping this month, but I won't hold my breath. (my credit card will breathe a sigh of relief though). Shrouded in mystery, Boba Fett, introduced to audiences in Star Wars: The Empire Strikes Back, proved so popular that he returned again to menace our heroes in the saga's concluding chapter, Star Wars: Return of the Jedi. Master Replicas proudly unveiled the first in our range of Boba Fett collectibles in 2006: the firearm of the galaxy's most notorious gun for hire. And what a weapon it is! 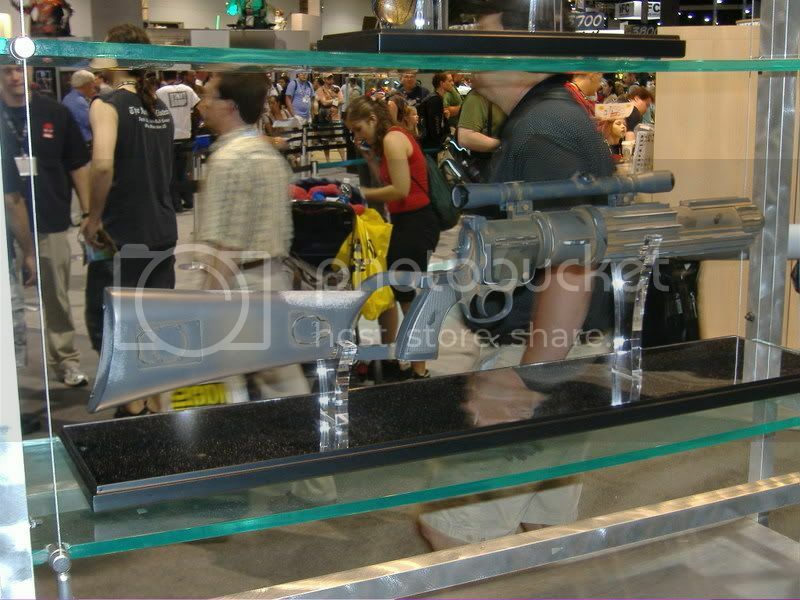 For the first time ever fans can own their very own, fully authorized, and licensed replica of the legendary bounty hunter's blaster from Star Wars: Episode VI Return of the Jedi. We sold out of these in August 2006 but with the delays in shipping we now have a FEW available to sell and we are offering them to the 2007 Collectors Society first! These will be available exclusively to the CS Members until August 8, 2007. Then if there are any remaining, they will be available to the general public on August 9, 2007. Don't miss your chance to unleash your inner mercenary - take out a contract on this today! There is estimated to be more than 6 Billion people in this world and now you have the opportunity to be one of only 1000 people to own the Signature Edition Boba Fett Blaster signed by Boba Fett himself, actor Jeremy Bulloch. Get this one in your sights and order yours today before this Signature Edition becomes as hard to find as an Alderaanian alp! We know you will enjoy this valuable addition to your Star Wars collection for many years to come. So don't delay these are shipping this week and they will not last! Is it just me, or does it look a little dusty? It looks like finger marks in dust on the barrel grip.. I think that might just be the weathered look they were trying to get. I would be happy to answer any questions you might have about our Boba Fett Blaster. It is an amazing piece! there's only one thing cooler than cool: ice cold. WOW! you mean your the.....but I......Man this is cool! How much would it cost to get that? Wow, fancy. Welcome to the boards, Amy. I know this has nothing to do with the blaster, but a lot of people were wondering when the full size helmet will be out? Also, how much will it cost? The gentleman at the Master Replica's booth was saying something around $399, maybe? He didn't have an actual price for it. Hey Amy! My e-tailer here in Australia has just today given me my final invoice telling me that it is now in stock and I can't wait! The Boba Fett Helmet will go on sale next week, the 29th I believe. I don't know the price yet but will come back in once I find out. It will probably be a little more expensive then some of our other helmets due to the electronics and very detailed painting. There is zero possibility of this as there is no way we could have it done by the end of the year. Sorry I didn't have better news for you. As for the helmet going on sale next week, I can't wait for that... and you said the magic word "electronics" whoo-hoo! Man, how do you get it in Australia quicker than we do stateside? WOW!! Just watched the video. HUGE box. I forgot about the top part of the display case. Somehow, I was half expecting to see you pull out a gun case from the box. Now that would've been a nice touch.